As of last Saturday, autumn is officially here. The calendar, and slowly but surely, the weather, have confirmed this! 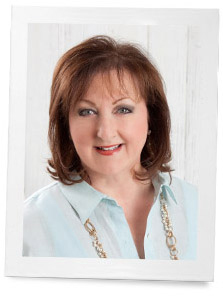 I was trying hard not to laugh out loud as I wrote this post, because I have been on autumn overdrive lately, but I don’t seem to be alone on this one. When the season hits, I just can’t help but constantly dream up how I am going to make my home (and meals at home) centered around embracing the season before it’s gone! I love the brilliant colors, the crisp air, and the wonderful fragrances of the season. I don’t know about you, but in the fall I add cinnamon and nutmeg to EVERYTHING. Coffee, oatmeal, buttered toast—these deep spices make the most simple foods just marvelous! In the fall, I put away summer plants and get out my pumpkin decorations. 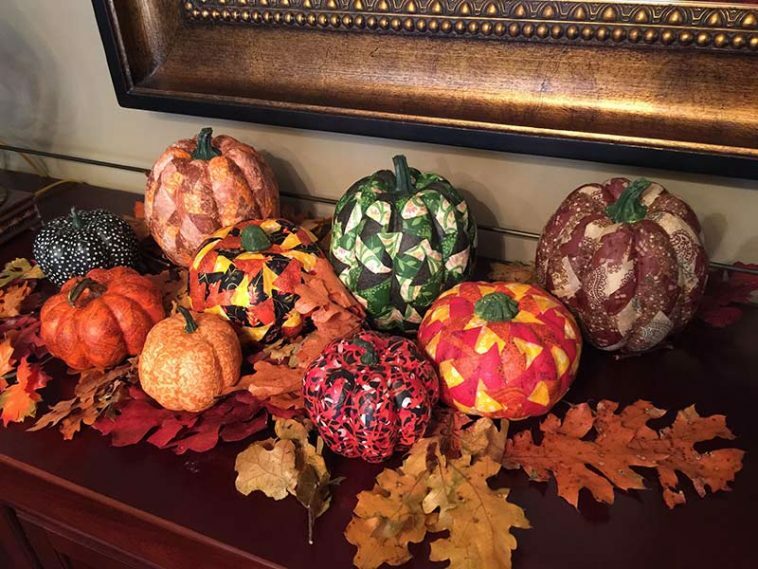 My mom makes the most wonderful pumpkins using plastic pumpkins and beautiful scraps left from sewing projects. At 90 years old, she is still creating spectacular things for our home. In my entryway, I have the ever-changing centerpiece table. It is usually decorated in fresh flowers, blooming orchids, or holiday greenery. For fall I use the pumpkins mom made and a lantern that I found at an antiques store. It is a reproduction, but I never grow tired of it! I surround my pumpkins with artificial leaves and acorns. 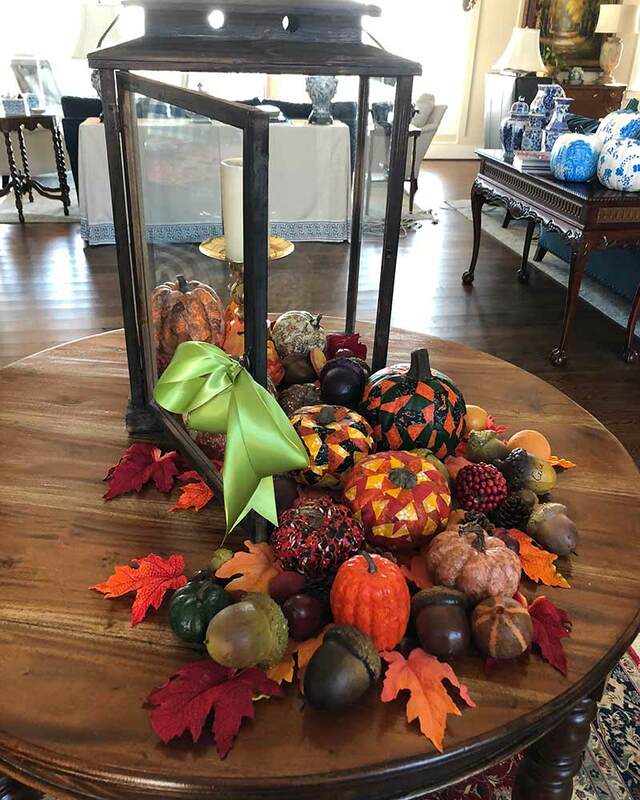 I hope you will enjoy the fall and use your favorite things in decorating your home. One way I love to get inspired is by the beautiful creations of others. Curling up with an issue of Southern Lady magazine, The Cottage Journal, and many others, is one of my favorite ways to wind down. 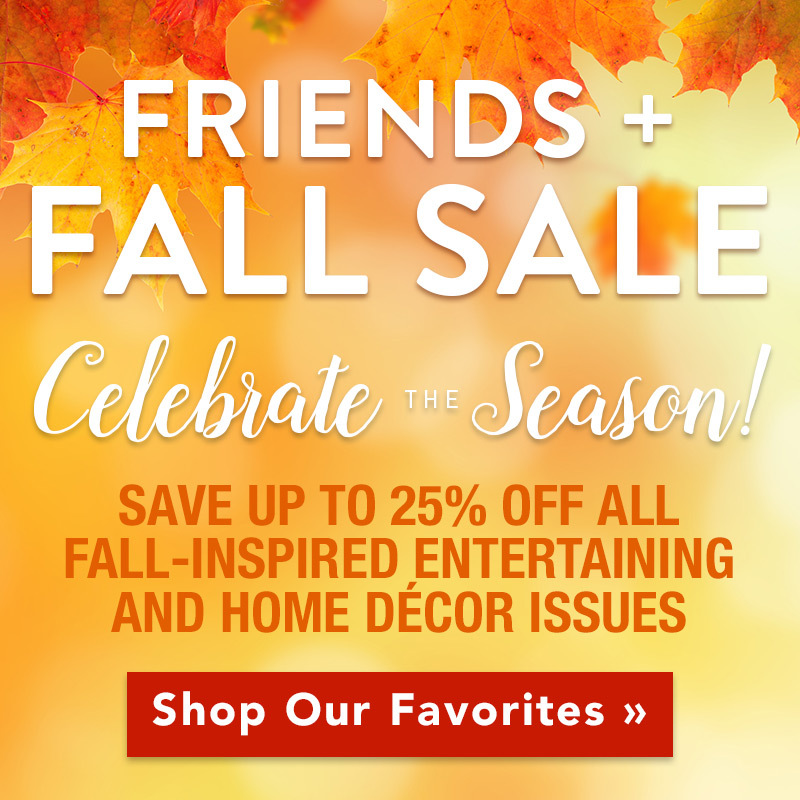 I’m excited to share that Hoffman Media is offering up to 25% off of our favorite fall-inspired home décor issues. And today is the last day of this sale, so now is the time! As always, I am humbled and grateful for your loyal readership and for the community we have here. Please remember you can email me at ribbon@hoffmanmedia.com. How do you transition your home (and recipes) for fall? Loved pix and way you use your mother’s pumpkins! I was thrilled to find a $12 all natural harvest wreath clearance at Home Accent Store this summer (nut cases,dried pods, leaves, pine cones, etc. ). It really picks up the brown hues of our arched wood Snow White cottage door. I love your Mom’s pumpkins. They are lovely. Does she decoupage them. I would love to try her idea myself. Thank you. She takes plastic or foam pumpkins and covers them in fabric squares or strips. She uses Modge Podge to adhere the fabric. When the pumpkin is completely covered, she uses an acrylic varnish for the final coat. It is really simple and she said you can cut the fabric into any size square or strip. I want fall to last forever. Phyllis, I love that your mother at 90, is still involved in making crafts…how wonderful for her and for you. How does your Mom make these,please? We have been traveling and I am so excited to get back to our Pacific Northwest home tomorrow and decorate for fall! Phyllis, I may do something similar with a lantern and pumpkins in my entry! Toss vegetables together. Pour into greased baking dish or pan. Drizzle oil and syrup over vegetables. Stir vegetables. Sprinkle sage, salt and pepper over vegetables. Stir again. Fall is my favorite season. I change out the summer décor for my fall favorites right after Labor Day. I adore fall too, but Florida doesn’t see much of it. I take my fall decorations serious so that I can at least dream about the change of season while I am inside. Around this time if year, I love putting potted purple or wine-color mums on our front porch. Add a few white or orange pumpkins and we’re looking autumn-ready. As for baking, a favorite fall casserole includes sweet potatoes, pears, celery and onion. I know that may not sound appealing but with the seasonings of maple syrup and sage, it’s a scrumptious comfort food for a chilly fall evening. Fall is the best season. At the end of August I bring out my Fall decorations. I love all the candles with the savory scent of Fall. I enjoy decorating. I put leaves around my windows and front glass door. I add pumpkins at each window and light then with batteries on October 1st. Everything is so colorful in the Fall, from the leaves to all the pumpkins. I love Fall and the cool, crisp air. I decorate the front of my house. I put Fall garlands on the railings and a lovely Fall wreath on my front door. The Fall also rings juicy Anjou pears which are my favorite. Fall is my favorite time of year. I start to put out the Fall decorations on display at the end of August.. The pumpkins with faces are turned turned around until Halloween. God Bless your mom. Your pumpkins on display are lovely. How wonderful your mother is still creating beauty for your home at age 90. You are blessed. I am looking forward to fall temperatures more this year than ever before. Hay bales,fall tablecloths, table runners and wool projects I have made,pumpkins,all things fall,love it! When Fall arrives, and the air becomes chilly, we switch our sheer curtains for velvet drapes to keep the drafts at bay and pull out the down comforter for the bed. As for decorating, we keep it simple as we live in a small apartment. I have a copper leaf candle holder and I pick up some candles in scents like Macintoch apple and cranberry chutney. I may bring in a few leaves or other things from nature to set on the coffee table. We also set out the pumpkin that will become our jack-o-lantern for Halloween. The biggest change takes place in our kitchen as we make lots of soups, stews, chili, and hot cereal with walnuts, cranberries, cinnamon, and nutmeg. Phyllis I’m so happy you still have your dear mother in your life. It’s also great that she is still able to be so creative. Happy fall! In Central FL, fall is just a wish! However, that doesn’t keep me from setting out my pumpkins, fall leaves, hay bales for layering, etc. My difficulty is not overdoing it! It gives me hope that cooler weather might be a reality! Enjoy your true fall weather for all of us just hoping for it!